Kelly Bennett sets out from Gamboa at 4:30 a.m., crossing the Panama Canal on the tall, cable-stayed Centennial bridge. The Smithsonian post-doctoral fellow is on a six-hour trek to the Azuero Peninsula to track two mosquito species capable of lethal viral diseases: malaria, yellow fever, dengue, Zika and Chikungunya. At 7 a.m. at a tiny fonda in Penonome, she meets Smithsonian research associate José Loaiza, who is also a senior scientist at Panama’s government research institute, INDICASAT, and professor at the University of Panama. Along with Loaiza’s research assistant José Ricardo Rovira and master’s student Alejandro Almanza, they polish off plates of eggs, tortillas, carimañolas (yucca pastries stuffed with meat) and bistec picado (beef stew), while Bennett and Loaiza finalize plans for the day. The “mosquito team” from the Smithsonian Tropical Research Institute will make this trip down the Azuero penninsula every month for the next three years, hoping to better understand the ecology of two of the world’s most dangerous organisms—the mosquitoes Aedes aegypti and Aedes albopictus. Aedes mosquitos carry a wide range of viral and parasitic diseases. The Smithsonian’s Sidedoor host Tony Cohn recently met with researchers there for the latest of his podcast reports. 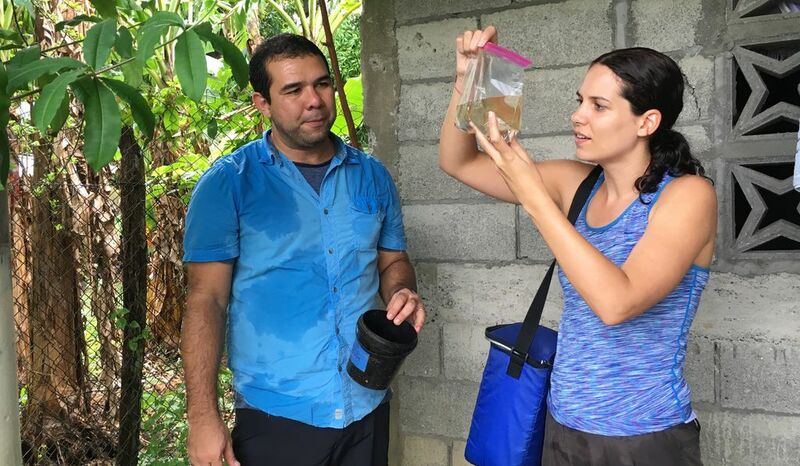 “More than 200 different mosquito species live in Panama,” says Bennett, whose fellowship to study mosquito genetics is sponsored by the Edward and Jeanne Kashian Family Foundation. The challenge for the team is to discover which Aedes mosquito species are at each site and whether they have the right environmental conditions to breed and to infect people with viral diseases. Aedes aegypti, from sub-Saharan Africa, first colonized Europe from the early 18th to the late 20th century. Now one of the most widespread mosquito species in the world, Aedes aegypti is still restricted to the tropics because it can’t survive winter. But surfing on recent heatwaves, it has begun to move both north and south. Like rats and cockroaches, Aedes aegypti’s success goes hand-in-hand with humans’ explosive population growth. It feeds mostly at dusk, at dawn, in the shade and indoors and breeds in standing water in containers and trash around homes. Researchers in Panama have kept track of Aedes aegypti for more than 100 years since the Cuban doctor, Carlos Findlay first suspected that it carried yellow fever, the disease that foiled the French attempt to build the Panama Canal, killing thousands of workers. Subsequent, draconian measures to eradicate yellow fever imposed by the U.S. military included fining owners of flower vases and baptismal fonts where larvae were found. They succeeded in eliminating yellow fever, but Aedes aegypti mosquitoes are back. Now another species, the Asian Tiger mosquito, is actively expanding around the world. Aedes albopictus arrived in Panama only about 15 years ago, hitchhiking in shipments of new and used tires. Its population doubled in France in the last two years. It was reported in Jamaica for the first time only this year. Tiger mosquitos bite aggressively during the daytime and carry many of the same diseases carried by Aedes aegypti. The most worrisome difference between the two species is that Aedes albopictus can live where it is cold. It has the potential to pick up a virus in one part of the world and infect people on another continent. Turning south off of the PanAmerican highway at Divisa, the team passes through La Arena and Chitre and on to Las Tablas, famous for its yearly Carnival blowout parades. The 40-some miles (68.7 kilometers) from Las Tablas to Tonosí takes nearly an hour-and-a-half—winding up hills clad in brown, sun-baked pastures bordered by leafy, living fences. Dogs sleep in the road as if dead, sprinting to safety split seconds before becoming roadkill. At the very top of the ridge, four old men slap dominoes down on a plastic table in an open fonda overlooking the Pacific. Then the road winds down to the coast. Tonosí purportedly takes its name from the indigenous big-man, Tocona, whose people succumbed to smallpox. These days about 2,300 people call the town home. A frontier town, it’s a gateway for tourists hoping to observe sea turtles nesting on the beaches at Caña and adventurers buying last-minute supplies for a trek into Cerro Hoya National Park. Loaiza parks the pickup in front of the first house. A woman gets up from the hammock on the porch to greet them. 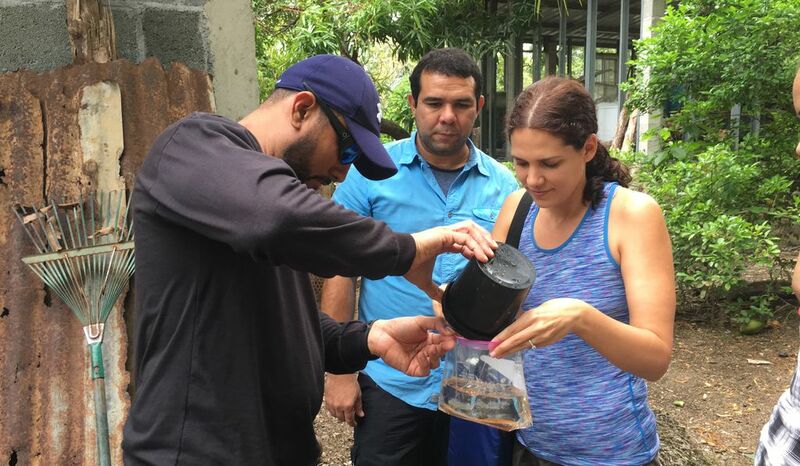 Loaiza and Bennett show her the larvae floating in the trap recovered from her yard. “The mosquitos lay their eggs on the popsicle stick. They hatch. The smallest larval stage comes out. Then the larvae pass through four more stages, getting bigger each time. And eventually they become adults and fly away. These little larvae are Aedes,” says Loaiza. Madeleine Ducasa pours the contents of the bucket into a plastic bag labeled with the location and date. Bennett wipes the bucket with a white cotton swab, dropping it into the bag with the stick. It’s covered with pinprick-sized mosquito eggs. “We won’t know if they’re Aedes aegypti or Aedes albopictus until we take them back to the lab and they emerge as adults,” she explains. Alejandro puts the bags in a plus-sized red cooler in the back of the truck. If the water gets too warm, the larvae die.” When he’s not helping with the mosquito project, he’s working on his master’s thesis, a study of a nocturnal biting fly species called Lutzomyia that transmits the disfiguring disease, leishmaniasis. At the next house, they smell lentils cooking. The water from the bucket is full of squirming larvae. “See that big larva there? That’s a predatory mosquito called Toxorhynchides. We have to get it out or it will eat all of the others.” Bennett siphons it off with her turkey baster and transfers it to a smaller bag. They walk around the corner of the next house, greeted by the broad smile of a woman vigorously grating coconut into an aluminum cooking pot. Her husband has been lining up cement blocks to enlarge their back patio, but he takes a break at her bidding, going inside to get a paper cup filled with miel de caña, molasses. She plans to cook the grated coconut with this syrup, adding some vanilla, to make cocadas. “I’m getting tired of grating,” the woman says, offering everyone coconut. Ducasa holds the cup as everyone dips uneven pieces of coco into the golden-brown syrup, a welcome mid-morning snack. The next house is surrounded by an edible garden of plantains, bananas, yucca and pumpkin vines with bright orange flowers. As we take a look at a plant we don’t recognize, the owner emerges from the back balcony to explain that it’s a home remedy for cleaning the blood. When we comment on the abundance of cherry tomatoes bunching on the vine along the side of the house, he goes back inside and emerges again with a pale-yellow plastic bag mounded with very cold, sweet bite-sized tomatoes, nothing like the hard, white-pulped tomatoes at the super market. Bennett walks past a rose bush in a sawed-off yellow plastic cooking-oil container to sample standing water in another flower pot with her turkey baster—no larvae there. The water in the mosquito trap looks suspiciously clear. While the students empty the bucket into a bag, Senior Rovira, an experienced entomologist at INDICASAT wearing a Smithsonian polo shirt, walks around the property looking for trash and containers of standing water. 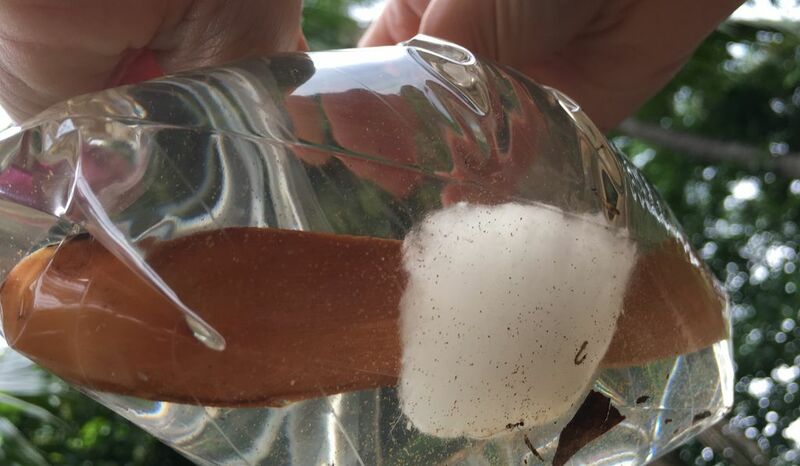 A half-melted plastic bottle on the ground nearby contains hundreds of larvae, leading us to suspect that the landlady may have emptied out the trap, replacing the water because she was nervous that the team had something to do with the government’s health department, which still fines people who have standing water harboring mosquito larvae on their property. Back in the truck, they continue down the road. The next house had mangoes behind it. “Is it ok if we take some mangos?” Loaiza asks the elderly couple on the porch after we empty the trap. “These are the best! They taste like pineapple!” Loaiza picks up a hard, green mango from the ground and sends it sailing up through the branches where it rips through several bunches of leaves, downing two dangling fruits, which bounce off in random directions, rolling among the cement paving stones of the garden. Alejandro’s Google map stops working because there’s no internet signal on his phone in this part of town. As a backup, he has photos of all the trap locations. The next house on the list is made from broad blue boards. The first blue house we come to has a pair of twin Chihuahuas with matching red collars on the porch. “I don’t remember those,” says Ducasa. The team heads to a restaurant for a late lunch. This afternoon they will move on to Cacao, a more rural community. On Saturday, they’ll work their way back up the peninsula. “Yes, so what we really want to know is who wins and who loses when these species meet,” Kelly continues. She has been analyzing the data they already collected in 2016 and 2017. “What if you calculate the distance from a major highway?” Loaiza suggests.